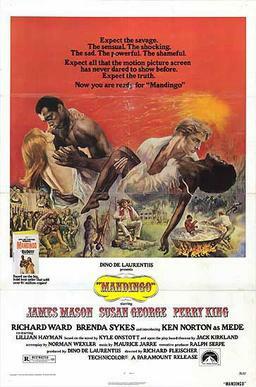 Mandingo is an American motion picture released by Paramount Pictures in 1975. It is based on the novel Mandingo by Kyle Onstott, and on the play Mandingo by Jack Kirkland (which is derived from the novel). The film was directed by Richard Fleischer and starred James Mason, Susan George, Perry King, and boxer-turned-actor Ken Norton. It was widely derided when released, although some reviews are positive. It was followed by a sequel in 1976, titled Drum, which also starred Norton. Director Quentin Tarantino has cited Mandingo and Showgirls as the only two instances "in the last twenty years [that] a major studio made a full-on, gigantic, big-budget exploitation movie". In Django Unchained, Tarantino took the nonhistorical terminology of "Mandingo fighting" from the use of "a Mandingo" being a fine slave for breeding in the film.